Simply the Best Way to Learn Spanish! Why Boquete, Panama? 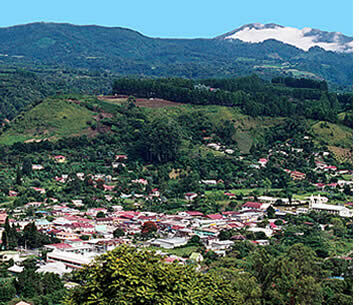 : a rural mountain town in Panama's highlands, just perfect for teens abroad. Daily Spanish Lessons: Spanish language lessons for teenagers in small groups or with a private tutor. 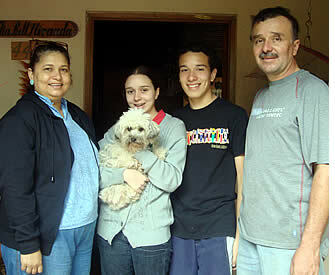 Family Home Stay: your teen will live with a carefully selected, responsible and caring local host family. Eco-Adventure Tours, Cultural-Social Activities & Volunteering: outdoor excursions and tours to keep your teenager wanting more excitement and natural beauty + cultural-social activities and volunteering. Step by Step Planning & Preparation: what needs to happen for your teenager to join our program. 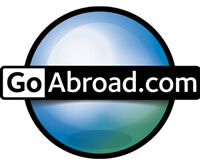 Rates: cost p/week for Spanish exchange programs. 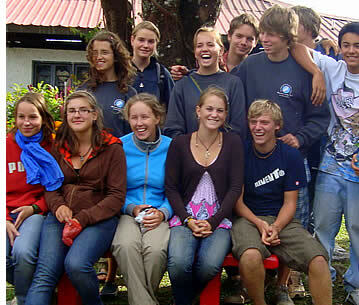 Our Spanish Exchange Program for Teens is only offered at our Spanish school in Boquete. 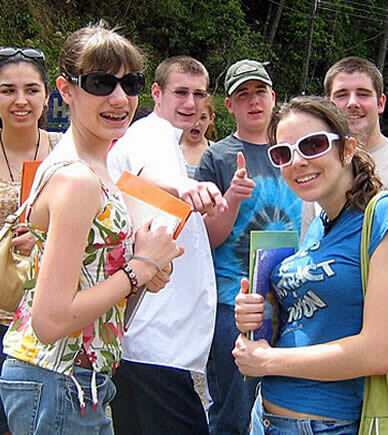 But if teens come to Panama with their parents or another adult, we are more than happy to also set them at our Spanish school in Bocas del Toro or at our Spanish school in Panama City. When teenagers are traveling to Panama on their own, we arrange airport pickups in Panama City and in David (and assist with transportation between both locations). A representative from our school will be waiting for your teenager at the airport with a sign with the school's and your teenager's name on it. Some parents fly their teens into the country, spend a week with them in Boquete also taking Spanish lessons and then fly back home while their teen continues with their Spanish exchange program. Whichever option you decide on, we will make sure that your teen quickly forgets about feeling homesick and starts having the time of his/her life. Most teens fall in love with Panama and are quite sad when it's time to fly back home because they've gained a new family and friends in Panama. 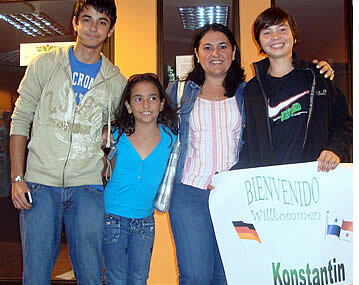 Once they're adults, many come back to visit Panama, our school, their friends and their host family! It is a well known fact that Panama is one of the safest countries to visit in Central and South America. And within Panama, the rural charming mountain town of Boquete is one of the safest destinations for tourists in Latin America. Its wonderful sense of community make it easy for students to practice their Spanish and interact with the locals. And the town's small compact layout simplifies your teen's logistics as they can mobilize themselves by short 15 - 20 minute walks or 5 - 10 minute bus rides from the school in downtown Boquete to their host family's house. The first time your teen comes to school and goes back home, a host family member will show them how to make the journey and will make sure they're comfortable. Teens will have breakfast and dinner with their host family, and they usually have lunch at a local restaurant close to Habla Ya Boquete Spanish School. Private lessons for teenagers are normally scheduled in the mornings, and group lessons are mostly scheduled in the afternoons. During the other half of the day, when your teenager is not attending Spanish classes, he or she will do his/her homework at the school student's area or at his/her host family's house. During the remaining time of the day, teens normally socialize with each other in town and on certain days, teens also join our eco-adventure tours. Dinner time at each family's house is different but can take place between 6 p.m. and 7:30 p.m. Teens have a curfew after dark (after dinner) and can only leave their host family's house if joined and under the supervision of one of their host parents. Teens who violate the curfew are reported to the school and depending on the circumstances can result in their expulsion from the program (under age consumption of alcohol - 18 -, results in automatic expulsion from the program). During the weekends, teens can enjoy full day eco-adventure tours in Boquete such as whitewater river rafting or island trips, and join their host family's normal activities, which vary from family to family, but can include visits to the river, beach, church, the movies or shopping in David or to one of Boquete's many parks and gardens. It's always nice to come to the tropics, but the lowland's heat could be too much for some teenagers to adapt to. Boquete is situated 1,200 meters above sea level and enjoys a year round spring like temperature of 60° to 80° F (16° - 28° C), which is just perfect to remain fresh without being too hot or too cold. Boquete is also blessed with abundant wildlife and nature, making it a wonderful place for outdoor exploration. With numerous hiking trails and outdoor pursuits, students have a wide variety of eco-adventures to choose from. Despite being in the mountains, we're only 1.5 hours away from the coast, so beach trips on the weekends are organized once or twice a month. 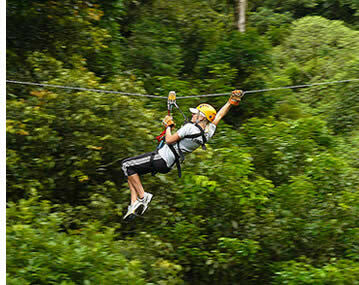 Habla Ya Spanish students benefit from discounted rates on many of Boquete's and Chiriqui's eco-adventure tours. Having your daughter's/son's Spanish learning trip in a mountain town, in a healthy environment within a community with traditional values, will make it easier for them to remain focused on their trip's objectives and away from the crazy party life that characterizes many beach towns. The Chiriqui Gulf Marine National Park is just 1.5 hours away, and trips to the beach during the weekends are organized once or twice a month in which your teenager and the rest of Habla Ya's Spanish students will have secluded islands just to themselves. It's certainly more productive and safer for a teenager to study Spanish during an extended period of time in an environment like Boquete, Panama. For teens from 13 to 17 years of age we offer Spanish language lessons, either privately or in a small group of no more than six students per class. Teens that are 16 and 17 years of age can also be placed in a group with young adults if they are mature enough. 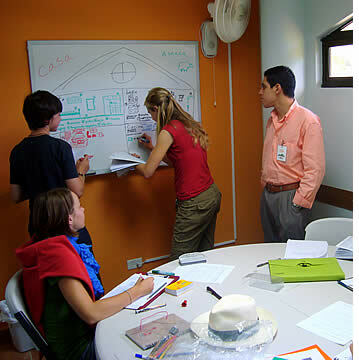 If your teenager would like to have group lessons, this can be arranged during Panama's high season (January and February) or during summer holidays (June, July or August). Your son or daughter's classmates will be of a similar age and Spanish level. Parents are always amazed and delighted when they realize how much their teenager learned in just three or four weeks of Spanish lessons, generally even more than what they've learnt in several years back home. If you would like your teen to become completely fluent in the Spanish language, depending on his/her current Spanish level of proficiency, you should aim for a two or three month Spanish exchange program. When learning Spanish, there is nothing that can compare, not even close by, to being fully immersed in a Latin American country. If you really want your teenager to become fluent in the Spanish language, a total Spanish immersion program is the best way to achieve it. We have had many teens participate in our program. If you would like to reassure yourself by getting in touch with other parents who've sent their teens to our Spanish school, please contact us and ask us for their contact details and we'll gladly put you in touch with them. If you would like to get your teenager truly immersed in the Latin culture, experience our way of life and expose them as much as possible to the Spanish language, then a family home stay is the way to go. Your teenagers will get a unique perspective about the way of life in Central America and they'll easily be able to practice their Spanish after class. We currently collaborate with more than 70 host families in Boquete, Panama that make our Total Spanish Immersion Program a reality. Many host families have been closely working with us for years and have plenty of experience with teenagers. Several host families also have experience with other exchange programs such as ASF. A good deal of our host families also have teenagers, and your teenager's host parents will take responsibility for the wellbeing of your son or daughter just as if it was their own, and truly make them part of their own family. Many teenagers remain in touch with their host families after going back home and we've even had host brothers and sisters that see each other again abroad (and students who repeat their visit as university students as well!). In order to ensure that we select the most appropriate host family for your teenager, please have your teen submit his or hers Home Stay Interview with as much as anticipation as possible. In this way, we will know their specific needs and have more host families to choose from. Once they fill out that interview, we will send you a full description of your teenager's host family with contact details and address, so that they can start imagining their exchange program and you can start having some peace of mind. Home stays for teens usually start on a Saturday and end on a Sunday, but we are flexible and can totally adapt to the flight tickets that your purchased for your teenager as long as you let us know in advance. Medical and travel insurance are mandatory for your teenager's Spanish exchange program (please consult your local insurance broker to purchase before traveling). In case of any medical emergency, your teenager's host family and the school's directors, will make sure that your teen gets to the hospital immediately. In downtown Boquete there are three clinics, and in David (30 minute drive away) there are several first class hospitals such as: Hospital Centro Médico Mae Lewis, Hospital Chiriquí, and the public Hospital Regional. Taking into account your teenager's interests, we will work with you to organize and plan a daily schedule of activities before the arrival of your teen to Panama. Please share the following information with your teenager and let us know what he or she would like to do in his/her free time after class. In order to organize and coordinate all of the volunteering activities there is a $5 USD per person per day volunteering fee. 100% of this fee goes as a direct donation to each Non Profit Organization. Your teenager will live one of the most amazing experiences that they've ever had. Your teen will go back home being not only fluent in the Spanish language but also more responsible, independent and mature. At the same time, we'll make sure they have a great time. At Habla Ya Spanish School we employ additional staff whose main responsibility is to make sure that our Spanish students have the time of their life outside of the classroom! Have your teen pay upon arrival or submit your credit card details via a secure and encrypted form on our website. We will provide the link to it. Teenagers on their own have joined our Spanish exchange program for up to four months and many of them decide to come back and brush up their Spanish before or during college. Your son or daughter's safety is our priority. If you would like to reassure yourself by getting in touch with other parents who've sent their teenagers to our Spanish school, please contact us and ask us for their contact details and we'll gladly put you in touch with them. Please note: prices are in US Dollars and include Spanish Course and home stay with 2 meals per day. For home stays in Bocas del Toro please add a supplement of $25 USD per person per week and of $50 USD for Panama City. Your teenager can join our Spanish Exchange program through our Group 4 Course (20 hours of lessons per week with a maximum of six students per class, $175 - $275 USD per week), Private Lessons (20, 25 or 30 hours of lessons per week, $295 - $395 USD per week), or a combination of both or what we call Group 4 PLUS (20 hours of Group Lessons + 5 or 10 hours of extra Private Lessons each week). When considering how many of hours to sign up for, take into account that each of our first three levels can be completed in an average of 60 hours of lessons each, our fourth and fifth in 100 hours each, and our sixth level in an average of 400 hours more (to be just like a native). As teens are living with a local host family ($250 USD per week with 2 meals per day in Boquete) they usually complete each level 10 to 25% faster (and young, motivated learners usually do better as well). We will always make a professional suggestion based on your teen's Spanish level, on how far you want him or her to advance and on how fast you want your teen to to get there. To see what your teen will be able to do upon completing each level you can visit our level system section and if your teen already knows some Spanish, please remember to have him/her complete our Placement Test. In the following table you'l find TOTAL COSTS considering different types of Spanish Courses with Accommodation included at a Local Host Family with two meals per day. In the following table you'll find TOTAL COSTS for a Spanish Immersion Program considering different types of Spanish Courses with Accommodation included at a Local Host Family with 2 meals per day (for other accommodation options please click here). A Full Immersion into the Spanish Language! The best way to become fluent... Contact us!